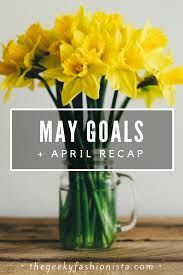 Here’s an update on my April and May goals. My first goal for April was to exercise at least ten minutes a day. I did it! That has been my goal for the last several months, and I finally did it. My goal for May will be the same. My second goal for April was to do cardio at least 5 days a week, and to do yoga and strength training at least 3 days a week each. I didn’t reach this goal, but I came fairly close. My goal for May will be the same goal. My third goal for April was to do a wall sit challenge, where you do a wall sit every day for as long as you can, trying to increase your time each day. I didn’t do it every day, but I did increase my time by 35 seconds. My third goal for May will be to take a walk at a local park at least three times. Happy May, and good luck on reaching your goals! Keep up the great work. I love your goals. You had a great April and now a good start for May. Sounds like you had a good April and good luck w/May! You're on the road to making lifestyle changes, good for you! Congratulations on accomplishing the exercise goal and doing well with the others. All healthy goals to strive for. You might not have reached100% but you are still 100% here and trying for those goals. You will enjoy walking in the local park and might even find yourself there more than 3 times a week.